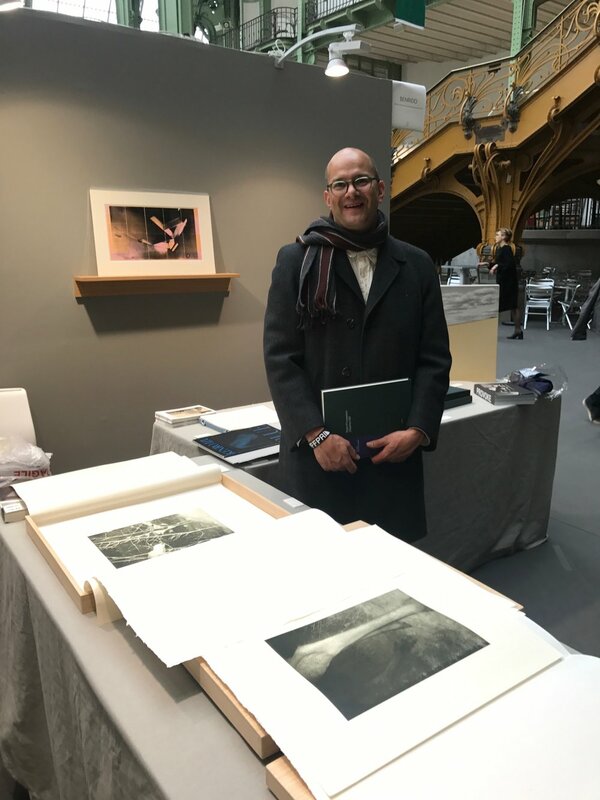 Paris Photo (8-12 November) showcased 189 exhibitors from 30 different countries beneath the glass, iron and steel roof of the beautiful Grand Palais. The fair was made up of four sections. The main area was for the galleries, which featured diverse presentations from the 19th century to today. On the first floor, the “Prismes” sector was devoted to 14 curated projects, often large-format series and solo shows. The 3rd section comprised 32 book publishers, hosting an exciting array of book signings with artists. Finally, a new addition to the programme focused on film, video and photography, held at the cinema space within the Grand Palais. This year’s fair had record attendance - 64,500 visitors over 5 days! It was an exciting week for the auction houses too. Notably, Man Ray’s highly anticipated “Noire et Blanche” (1926) of the artist’s muse Kiki de Montparnasse, sold at Christie’s Paris last Thursday for €2.6 million ($3.1 m), setting a new world record for classic photography! Here are a few of my highlights from a busy and inspiring week at the fair! It was thrilling to view recently discovered vintage prints by Shigeru Onishi (1928 – 1994, Japan), which was presented in a solo exhibition at MEM gallery’s stand. Onishi was a mathematician and an artist, who produced surrealist photographs and abstract ink paintings. Between the 1950s and 1970s, his work was introduced to Europe, but perhaps due to not being affiliated with any clear school, and shifting from photography to painting, his photographic work somehow disappeared from the public eye. Fortunately, it was safely kept by his family and now, 50 years later, the work is being reconsidered by museums and collectors. each image is a singular, luminous object. Chiara’s process creates unique, large-scale prints and recalls the early days of the medium when artists dealt with heavy, awkward equipment and endured long exposure and development times. The design of the cameras allows the artist to simultaneously shoot and perform his darkroom work while images are recorded directly onto oversized photosensitive paper. The prints retain traces of the developing process such as streaks, drips, and unevenly saturated colors, evidence of the hands-on nature of their making. I enjoyed the sense of calm entering Robert Morat’s minimal curation. Predominantly abstract works by artists such as Bill Jacobson and Jessica Backhaus balanced with more representational imagery with a pared down aesthetic. One of the highlights for me was the grid of small photographs by Peter Puklus (b. 1980, Hungary), from his series “The Epic Love Story of a Warrior”. This project ambitiously covers almost 100 years of European history in a symbolic collage that references events such as World War I to the collapse of the Soviet Union, although some of the connections are fairly elusive. 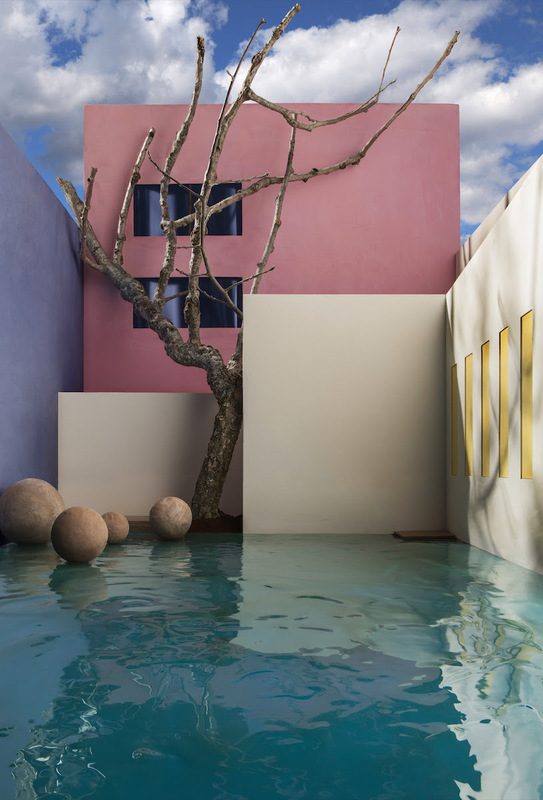 Nudes combined with sculptural elements hang alongside bricolage style constructions, usually made from basic materials, and black & white prints are interspersed with colour. Although Puklus’ work has clear cultural and political associations, there is also a pure aesthetic appeal in the playful dialogue and minimal compositions, where you can certainly create your own pairings, groupings and narratives. At less than €2,000 each, they are very tempting too! Peter Puklus had a solo exhibition “Unsafe to Dance” at C/O Berlin in 2016, and has been nominated for the 2018 Deutsche Börse Photography Foundation Prize. Benrido is one of the world’s last remaining producers of collotype prints (a process invented in the late 19th century). The atelier offers selected contemporary artists the opportunity to do a residency in Kyoto and collaborate with the master printers to make exquisitely realised works. This collaboration is unique. The highly skilled printers encourage the artists to see how far they can push their images, to create ever more refined and elegant prints. Quality is ubiquitous - in the artworks, tones, paper and beautiful portfolio box presentations! Benrido’s booth at Paris Photo was a hub of activity with artists coming to view and sign prints. A few chance encounters can be seen below such as the British artist Stephen Gill standing next to his portfolio of prints from his “Night Procession” series, the first photographs since his move to rural southern Sweden from Hackney, London. Further below, Antony Cairns signs his colour collotype print, “IBM_LDN4_20”, where he used redundant IBM computer punch cards to print his photographs digitally, later assembling them to create a composite image. Kicken’s booth stood out both in terms of its original architectural format of a maze of columns, and the quality of the artworks. The gallery presented mainly vintage and contemporary works by German photographers such as unique photograms by Floris Neususs (1960s/70s) and striking portraits by Helga Paris (1980s) and Sibylle Bergemann (1970s), along with earlier masters such as Albert Renger-Patzsch (1930s). Important and enticing modernist vintage prints from central Europe were also exhibited including Lszl Moholy-Nagy, Erwin Blumenfeld, Heinrich Kühn, Rudolf Koppitz and Ed van der Elsken. Klaus Rinke’s performative 112-part work “Mutations I” (1970) was showcased by Kicken in the Prismes section. The gallery also participated in a co-presentation with Galerie Sies + Höke, Düsseldorf, of Sigmar Polke’s experimental photographic work from the late 1970s to the 1990s. Disregarding the basic rules of shooting and processing, Polke created imagery with a distinctly painterly approach, and embraced endless experimentations in the darkroom. The prices for the Polke works were comfortably in the 6-digits. There is a strong trend towards exploring the making of images, rather than the taking of a photograph, and this was no better seen than at Yossi Milo’s stand! A few highlights from their booth represent new positions in camera-less photography. Meghann Riepenhoff (b.1979, USA) uses one of photography’s oldest techniques, the cyanotype. Her process is extremely physical she submerges the paper in ocean waves or drapes it over tree branches during storms to create these beautiful and textured unique works. Part of the poetry is knowing how much is left to chance and the spontaneity of her practice in nature. light leaks, oxidation or mold in the photographic emulsion. For her “Fours” series, she dipped the paper into developer at different angles. Various tones from black, brown to white emerge and Rossiter combines four developed sheets to create large-scale abstract and sculptural compositions. in the photographs are very enticing – and the artist’s deception keeps you looking and questioning! Stevenson’s presentation of Viviane Sassen’s (b. 1972, Netherlands) photographic works from her series “Of Mud and Lotus” and “Roxane II” was both beautiful and disorientating. Sassen credits the colours and contrasts of Africa (she spent the first 5 years of her life in Kenya and continues to travel and work there) as a key inspiration. Although she now devotes more time to personal projects, she is best known as a fashion photographer who has built her reputation on breaking the rules! She experiments with collage, hand-coloured elements and streaks of pigment – it’s often hard to make out where the photograph ends and her interventions begin. This is further emphasised by the playful hang; a small distorted portrait next to an abstracted painted body part, integrated with performance, encourage layered readings and responses. Take a tour with Diana in Zurich to discover more!